This article describes a simple Node.js application that uses Server Sent Events (SSE) technology to push updates to a simple HTML client, served through the Express framework. The updates originate from messages consumed from a Kafka Topic. 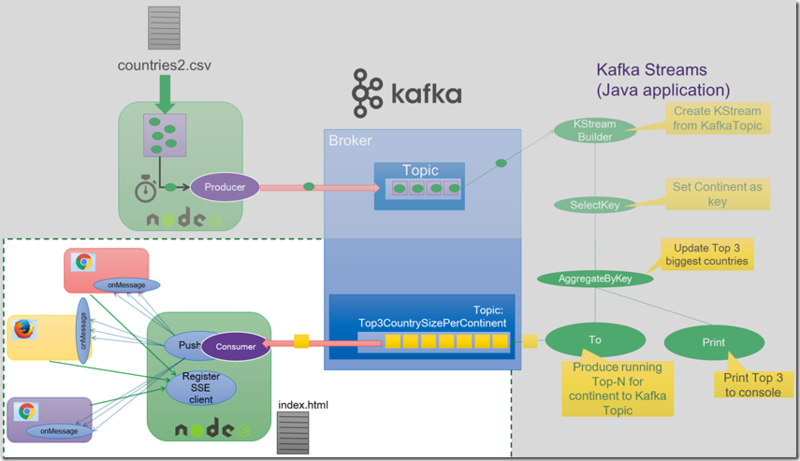 Although the approach outlined in this article stands on its own, and does not even depend on Apache Kafka, it also forms the next step in a series of articles that describe an Kafka Streams application that processes messages on a Kafka Topic – deriving running Top N ranks – and produces them to another Kafka Topic. The Node.js application in this current article consumes the Top N messages and pushes them to the HTML client. 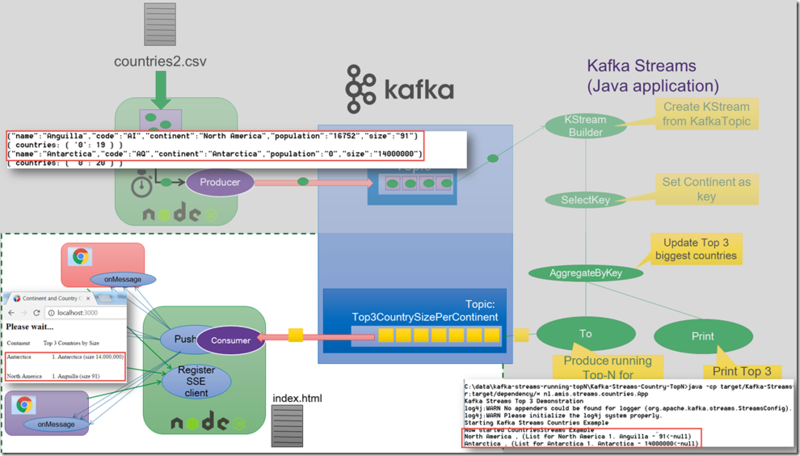 Sources are found on GitHub:https://github.com/lucasjellema/kafka-streams-running-topN/tree/master/kafka-node-express-topN-sse . The SSE server is located at a path /topn/updates relative to the path where the index.html document was loaded (http://host:port/index.html – downloaded from the public sub directory in the Node application where static resources are located and served from). Requests to this URL path are handled through the Express framework in the Node application. The content of the function is fairly straightforward: the JSON payload from the event is parsed. 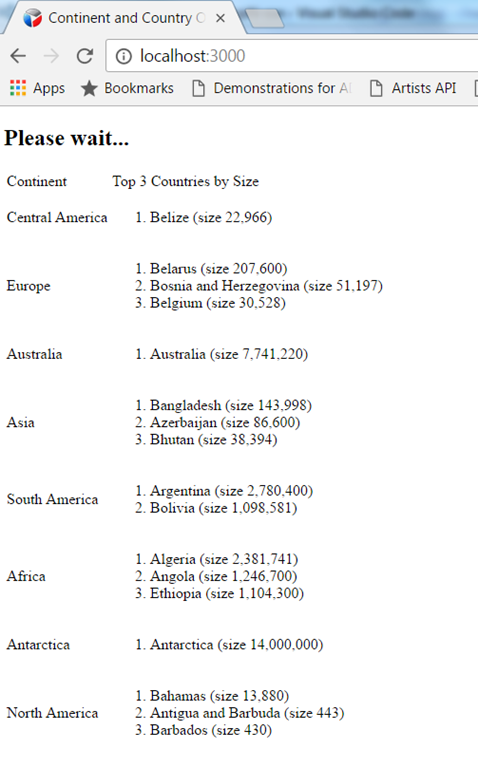 It contains the name of a continent and an array of the current top 3 countries by size in that continent. 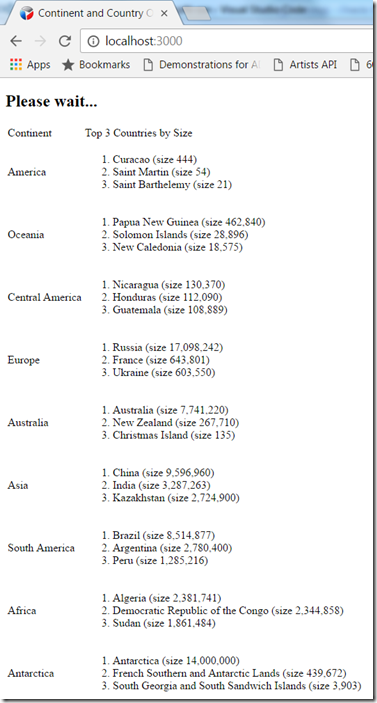 Based on this information, the function locates the continent row (if it does not yet exist, the row is created) in the table with top3 records. 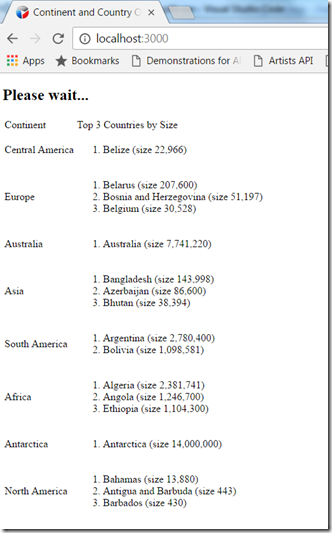 The top3 in the SSE event is written to the innnerHTML property of the second table cell in the continent’s table row. 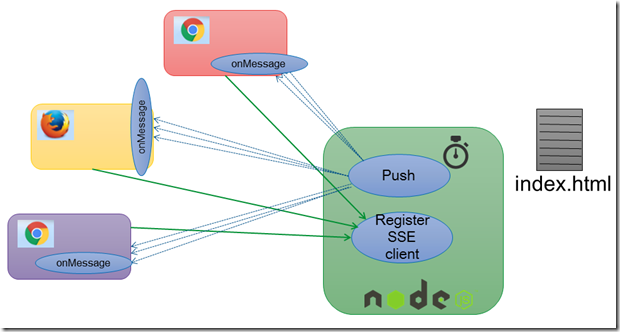 The server side in this article consists of a simple Node application that leverages the Express module as well as the kafka-node module. 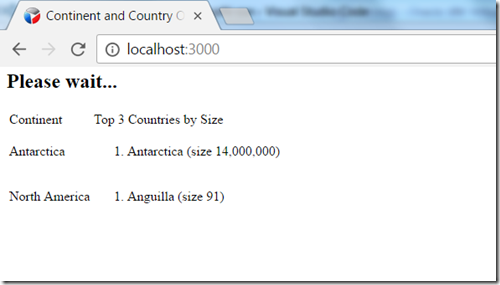 A simple, generic SSE library is used – in the file sse.js. It exports the Connection object – that represents the SSE channel to a single client – and the Topic object that manages a collection of Connections (for all SSE consumers around a specific subject). When the connection under a Connection ends (on close), the Connection is removed from the Collection. * A Connection is a simple SSE manager for 1 client. * A Topic handles a bundle of connections with cleanup after lost connection. 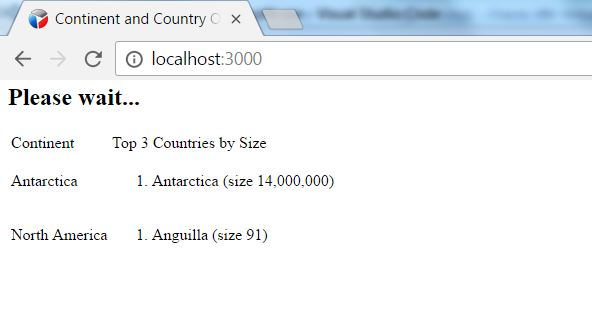 This program serves a static HTML file (through the Express framework on top of Node). The browser that loads this HTML document registers itself as an SSE client with this program. This program consumes Kafka messages from topic Top3CountrySizePerContinent to which the Running Top3 (size of countries by continent) is produced. 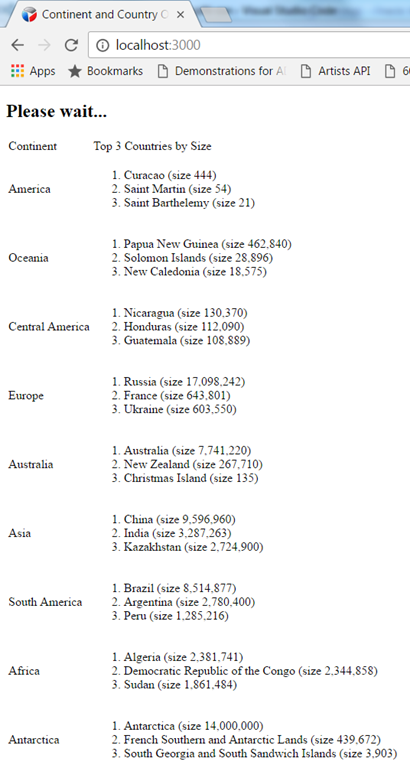 This is the result of all the individual top3 messages pushed as SSE events from the Node application to the browser client. The screenshot shows only one browser client; however, many browsers could have connected to the same Node server and have received the same SSE events simultaneously.